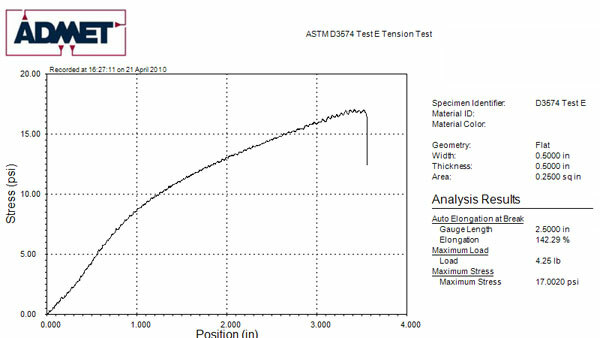 ASTM D3574 Test E determines the tensile strength and elongation of slab, bonded, and molded flexible cellular urethane foams. 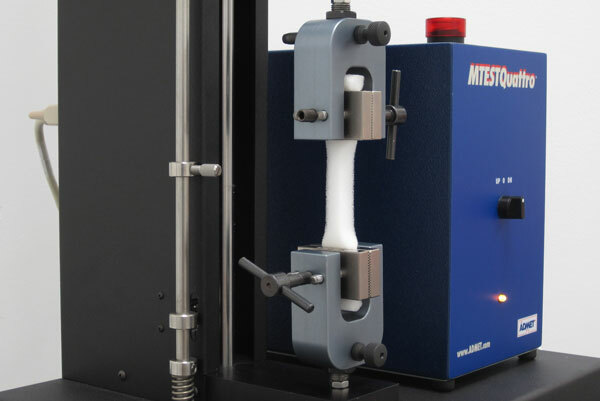 The D3574 Test E test procedure is similar to other polymer tests, but gripping the sample and measuring elongation require a bit more care. The minimum sample thickness is 12.5mm. Thicker samples are more commonly tested, therefore, manual or pneumatic vise grips with at least a 20mm wide opening are best. Measuring elongation is tricky because the sample is “dogbone” shaped. Using grip separation to measure elongation is less than ideal due to the non-uniform specimen width between grips. Despite this, it is still common to measure elongation using grip separation because clip-on contacting extensometers distort the sample and cause premature breakage. Non-contacting optical extensometers work well but the high cost (often times more expensive than the rest of the testing machine) makes them unpractical. Prior to conducting ASTM D3574 E, it is important to read the entire specification in the relevant ASTM publication. Use a sharp die to prepare a dogbone sample. 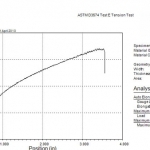 Sample dimensions are shown in Figure 1 of the ASTM D3574 Test E specification. Die A of Test Method D412 is also acceptable. Clamp the sample ends in the grips and record the distance between the grips. 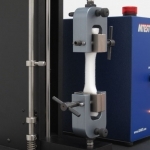 Pull the sample at a constant rate of grip separation as specified in Test E.
Record force and grip separation until specimen break. Just have a quick question about running ASTM D3574 E on your system?